Damascus Gate The most massive and ornate of all of Jerusalem's gates. The road running off it leads to Shechem (Nablus) and then to Damascus. The origins of the entry into the Old City that is today known (in English) as Damascus Gate date back to the second century CE, the period of the Roman city. At that time it was a triple gate, resembling a triumphal arch, and was probably not attached to the wall. Later, when it was connected to the wall, it was flanked by guardrooms. Impressive remains of the Roman gate still exist, including a whole arch above which it is possible to make out parts of an inscription reading To the colony of Aelia Capitolina by order of the city dignitaries. • Synagogues - A comprehensive listing of Jerusalem Synagogues, Jerusalem Shuls and Jerusalem Jewish Temples. • Churches - Complete guide to the Churches in Jerusalem, including photos. 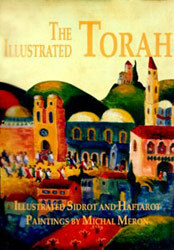 Fully illustrated, colorful and attractive, and includes the weekly Torah portions and the Haftarot readings (weekly readings from the Writings and the Prophets). God said, "Let there be light"; and there was light. Serves as a link between the newer districts to the north and the Old City to the south of Jerusalem the Damascus gate. The Damascus Gate Jerusalem, built in 1537, is the finest and most splendid of the gates built in the reign of Suleiman the Magnificent. The gate continued to serve as the city's main entrance in Byzantine times. It led immediately to a round plaza in the center of which stood a column topped by a statue of the emperor. This is probably the origin of the gate's Arabic name: "Bab al-Amud", the Gate of the Pillar. Old City Jerusalem. The food market at the Damascus Gate.